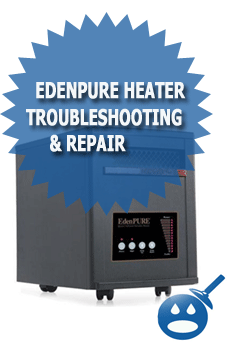 If you have the EdenPure Heater and you are having some trouble with it, you might want to do something they call troubleshooting. 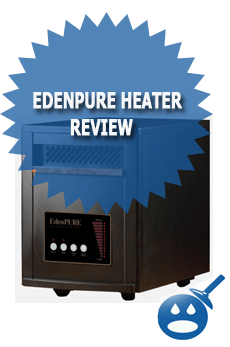 When you troubleshoot your EdenPure Heater you will be diagnosing what is wrong with the heater so you can fix it and have nice warm heat again. Sometimes the problem is as easy as plugging the heater in because someone has accidently unplugged it, or sometimes the problem is a little more advanced like you may need to change one of the infrared bulbs inside of the unit. If you have any troubleshooting tips for others that you have learned along the way or need help yourself you can leave your questions and comments on the bottom of this Edenepure Heater TroubleShooting Repair Guide. If your EdenPure Heater is not heating the room the first thing you will want to check is to make sure that the heater is plugged into the electrical outlet. Sometimes the cord can get unplugged by accident by someone else in the household. If the cord is plugged in you will also want to make sure that the circuit breaker has not been tripped. After you have made sure that the circuit is good and the EdenPure is plugged in you will now want to make sure you have no drafty doors or windows. If your doors or windows are leaking, that will cause the room to constantly be filling with cold air and could cause the EdenPure not to work. You have to remember this is a heater, Its not made to heat an area that has a wide open window / door etc. Also you will have to note that this kind of personal (or zone) heater is originally designed for small area, which is about 300 ~ 400 sq ft. It is supplemental heat, and not to be replaced by the main source of heating system in the house. If your floor materials are made of cement or tile, the time to warm up the room will be doubled as those kind of floor surfaces will absorb a lot of heat during the heat up process. I have an eden pure model 1000 heater, It is extremely difficult to find any place to buy one of the quarts bulbs, I finally did find a dealer who also repairs them, The cost of each bulb was $ 18.00, and there is a total of 6 of these bulbs inside the heater with an additional bulb at the front of the heater. The bulbs are wired in series in pairs of two. So I ended up getting two bulbs for 36.00 dollars. I was able to install them myself, I have no idea what they would have charged me to put them in. I would love to know if there is anywere these bulbs can be bought for less than the $ 18.00 dollars. I found a set of three on ebay for $ 56.00 dollars. So if your bulbs do need to be replaced you can see that even Raymond was able to change these bulbs himself for under $40. Off course you could always hire the local EdenPure Repair shop to replace the bulbs inside of the heater for you if you are not that handy, or do not have the time. The manufacturer originally designed the heater to blow out all the heat inside the unit approximately every 3 minutes, if the unit recognizes the desired temperature has been met in the room. This can also happen when the heater goes into a cool down mode, for example if you power it off. So wait for a little bit once you turned it on, check to see if the unit has been running for a while and if it still blows the cold air. First off, check to ensure that you have turn the master power switch to OFF position manually. As explained above, the fan will still run even after you turned off the unit. It is designed as such, until the heat chambers have completely cooled down. Then the fan will shut off by itself after a few minutes, so don’t be alarmed by this behavior. You can clean your EdenPure Heater with some general household products and a set of rags. You will want to keep your EdenPure Heater clean and free of all dust and dirt, so not only will your heater look good, but other people will not think you are a slob. You can apply your favorite household cleaner to a rag and then wipe down the outside of the EdenPure Heater and you will have one good looking heater even if it doesn’t work as you expected. It still makes one heck of a conversation piece when you have company over and then suddenly there is a loss of words in the room.